Unlike Sandberg's, which was constructed of logs, the National Forest Inn sported neatly trimmed white clapboard buildings. A gentleman named Courtemanche built it. The exact date of construction is not clear but it is mentioned in a 1925 newspaper clipping. A 1926 touring guide indicated that there were nine rooms in cottages, most with running water. They also had a garage and auto camp. 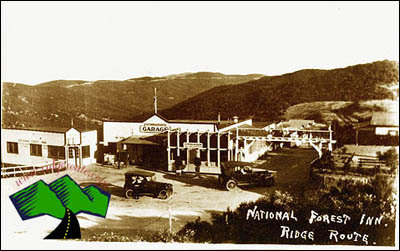 The National Forest Inn was destroyed by a fire, which originated in the garage on October 20, 1932 . All that remains today are cement steps on the West Side of the road.